The Irish Government has started a program to issue Irish Hertiage Certificates. 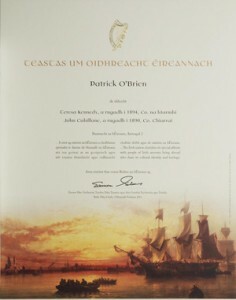 The certificates are designed to be official recognition of your Irish hertiage. These certificates are something that are being sold and can be given as gifts. In order to purchase a certificate you must provide a link to an ancestor from Ireland and they have links to geanology services that can help you to locate this link.